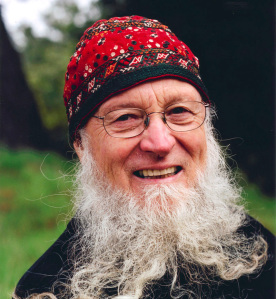 The title of Terry Riley’s improvisation template Descending moonshine dervishes is rooted in several sources. “Moonshine” may be considered a triple entendre referring to the mysticism of the shining moon, the ecstasy associated with U.S. moonshine liquor, and Riley’s property on Moonshine Road in the Yuba River country of California’s Sierra foothills, which he has dubbed Shri Moonshine Ranch. Dervishes are adherents of Sufism, and although Riley subscribes to a general spirituality rather than any formal religious orientation the Sufi tradition has clearly been important to him, as evinced by his performances in mosques and with musicians more closely involved with Sufism. Riley has also used the word dervish in reference to his Hindustani music teacher, Pran Nath. This according to “Terry Riley in the 70s” by Mark Alburger (21st-century music XI/3 [March 2004] pp. 4–7).